The Wanatah Historical Society Museum features hundreds of items of local historical interest, photos, etc. to promote awareness of the area's rich history. Located in a fully restored 1888 Caboose from the Monon Railroad, the museum is located on West Cross Street next to the grain elevator, one block west of the Historic Yellowstone Trail which ran through downtown Wanatah. A fully restored 1888 wooden caboose filled with railroad memorabilia. 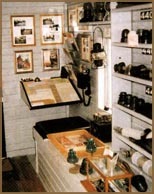 Hundreds of historical photographs framed and displayed. Railroad items from over fifteen different railroads. A beautiful Memorial Courtyard full of inscribed bricks. A historical marker showing where the Abraham Lincoln Funeral Train stopped on May 1, 1865. A beautiful town park surrounding the museum.